The Crinan Canal is one of Argyll & Bute’s most popular tourism attractions bringing significant economic benefit to the local area. The Ardrishaig Pier supports timber freight operations that take significant tonnage of timber transport of the road network – supporting the environment , increasing safety and also reducing deterioration of the road network infrastructure. Following the partial collapse of a section of the north side of the pier in May 2017, Ardrishaig Pier was closed for safety reasons until funding was secured to undertake repairs. 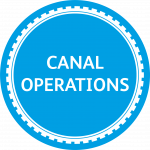 A Scottish Government grant enabled Scottish Canals to rebuild the pier and reopen it to freight use, as well as undertake works to ensure the future operation of the pier. Works began in March 2018 to install a rock revetment to stabilise the masonry section of the pier that collapsed and also to extend the pier by 15m used a sheet piled wall construction. During the project significant erosion of existing sheet piling walls on the northside of the pier was uncovered – requiring major underwater steel plate repairs to establish the structural stability of the walls. Additional works to upgrade the pier in terms of lighting, fencing and security to meet modern port standards also undertaken. The project was completed and the pier reopened on 15th October 2018.